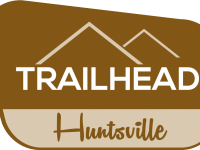 Trailhead is North Alabama’s newest mixed-use community, nestled at the base of scenic Chapman Mountain and just minutes from Downtown Huntsville. Legacy Homes’ Park Collection Plan Series for single-family residential offers quality, energy-efficient homes with award-winning floor plans at an extraordinary value. 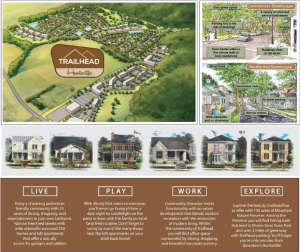 Trailhead will also feature Lofts, Flats, Townhomes along with community amenities like walking trails, specialty retailers, restaurants, and entertainment. Enjoy a charming pedestrain friendly community with 25 acres of dining, shopping, and entertainment in your own backyard. Narrow tree lined streets with wide sidewalks surround 250 homes and loft apartments that offer a rear alley access for garage and utilities. With dining that caters to everyone, you’ll never go hungry. Have a date night by candelight on the patio or feast with family on local farm fresh cuisine. Don’t forget to swing by one of the many shops near the loft apartments on your stroll back home. Community character meets functionality with an urban development that blends outdoor recreation with the necessities of modern living. 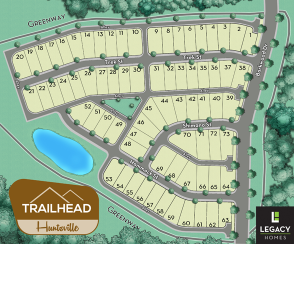 Within the community of Trailhead, you will find office space surrounded by dining, shopping, and beautiful mountain scenery. 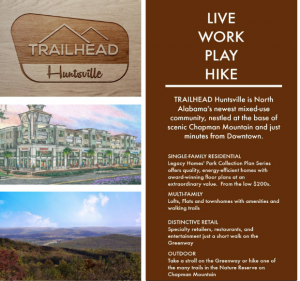 Explore the beauty Trailhead has to offer with 150 acres of Mountain Nature Preserve. Among the Preserve you will find hiking trails that lead to Monte Sano State Park and over 2 miles of greenway with Trailhead parking. You’ll forget you’re only a 6 minute drive from downtown Huntsville! Follow I-565 East past Downtown Huntsville and continue on Hwy 72 E for 1.4 miles. Turn right onto Moores Mill. Only a 6 minute drive from Downtown Huntsville!